Keeping with the recent tradition of righting wrongs and answering fan questions, the How I Met Your Mother team has decided to reveal/add another Easter Egg to their Series Box Set. What’s the gift this time? 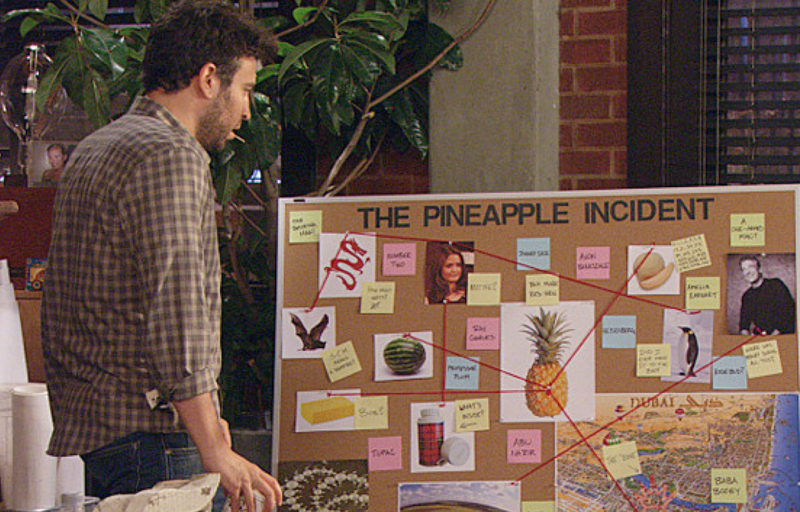 Well it just so happens to be the answer we’ve been looking for since the first Season: The Pineapple Incident. Sure we learned who Trudy was and how she got in Ted’s bed; but we never found out where the pineapple came from. Did Ted rob a bodega? Get one hurled at him while he tried to train like Rocky? Get it from a penguin? WHAT HAPPENED?!?!?!?! Well now we finally have an answer to that question thanks to a revealed deleted scene from the Season 9 Episode “Daisy” where Marshal, Ted, and Barney go to confront the Captain about Lilly’s whereabouts only to discover she is pregnant. Now if you want to live in mystery, STOP reading now. But if you want the question to be answered, check out the clip here. So there you have it. Turns out Zoey wasn’t the first thing Ted stole from the Captain. Years earlier he stole the pineapple out front of the Captain’s Manhattan apartment – a seafaring gesture. Do you accept this answer or did you expect something else? Sound off in the comments below to let me know.